Nuclear engineering begins with nuclear matter, and UC Berkeley literally created that field. Robert Sproul (the namesake of Sproul Hall and Plaza) hired Ernest Lawrence as a physics professor in 1928, and within two years, Lawrence invented the cyclotron, a particle accelerator that spins charged atoms (nuclei) in a circle like a merry-go-round and then slingshots them at high speeds. By slamming high-velocity heavy hydrogen nuclei into molybdenum, Lawrence’s team created the first artificial element, technetium, in 1937. (Technetium was discovered in Italy because Emilio Segrè performed the radiochemistry on Lawrence’s sample there.) More nuclear materials followed: neptunium in spring 1940, plutonium in February 1941 and a whole series of other elements since, including berkelium, californium, lawrencium (named after Lawrence) and seaborgium (named after Glenn Seaborg, a co-discoverer of plutonium). Lawrence’s “Radiation Laboratory,” which moved up onto the hill to have more space, was the direct predecessor of today’s Lawrence Berkeley National Laboratory. The first use of nuclear matter was for the military’s atomic bombs in World War II. Another UC Berkeley physics professor, J. Robert Oppenheimer, was in charge of the nuclear engineering and science of the Manhattan Project. After the war, though, attention turned to peaceful uses. Seaborg continued his nuclear chemistry research and, in 1958, became the second chancellor of UC Berkeley. By then, the mechanical engineering department was already offering master’s degrees in nuclear engineering; then-chancellor Seaborg added faculty from other disciplines and elevated the program to a stand-alone unit, founding the department of nuclear engineering. Within eight years, the new department constructed Etcheverry Hall and installed a TRIGA Mark III research nuclear reactor in its basement. At about the same time, General Electric, PG&E and Bechtel built and operated the Vallecitos Boiling Water Reactor, the world’s first privately owned and operated nuclear power plant to deliver significant quantities of electricity to a public utility grid. Construction also began at San Onofre Nuclear Generating Station and Diablo Canyon Power Plant. California now had nuclear power, and UC Berkeley had the nuclear engineering department to educate personnel and push the boundaries of the technology. Today, the department’s TRIGA reactor is gone (it was removed in the early ’90s), and all of the power reactors except for Diablo Canyon have ceased operation. Nevertheless, Diablo Canyon just by itself still produces more than 8 percent of California’s electricity, and it does so without emitting any greenhouse gases and without using up large amounts of land and natural resources. Further, nuclear power is a completely domestic power source, making us independent from technology or resource import. Indeed, the energy density of nuclear power is its greatest strength: One thousand megawatts of nuclear-generated electricity requires little more than 1 square mile and remains, as of yet, the only option for large-scale, 24/7, emissions-free production of electricity without damming up rivers and lakes. Even after large-scale energy storage is developed fostering more wind and solar power, nuclear power will continue to fill the important role of providing emissions-free power wherever land and resources are insufficient. This opportunity is why a new wave of nuclear power tech companies is building up in California, from Kairos Power in Oakland to TAE Technologies in Orange County. These companies are developing new technologies to make nuclear fission and fusion power even more economical, safe and environmentally friendly. Here at UC Berkeley, the nuclear engineering department, now celebrating its 60-year anniversary, is busy tackling the whole spectrum of nuclear technology. Faculty members are developing new coolants, fuels and designs for advanced nuclear reactors. The department hosts the Nuclear Science and Security Consortium, which is training students nationwide in the skills and technologies of international nuclear treaties and security. After the Fukushima accident, nuclear engineering researchers monitored the air, water and food here in Berkeley to verify that they were uncontaminated, and they still collaborate with schools in Japan to demonstrate the safety of the environment there. Faculty members continue to develop new radiation-detection systems, such as for mapping the natural background radiation in the Bay Area to serve as a baseline for spotting anomalies. The department and UCSF are setting up a certified medical physics program to train nuclear engineers to create and deliver the radiotherapies that doctors order for their patients. And every year, the department hosts the Nuclear Innovation Bootcamp, which melds entrepreneurial training with nuclear-related problems in order to train students to create more nuclear-tech startup companies like the ones already here in California. UC Berkeley’s nuclear engineering department is dedicated to continuing the legacy of all aspects of nuclear power, security and safety through education and research in the years to come. 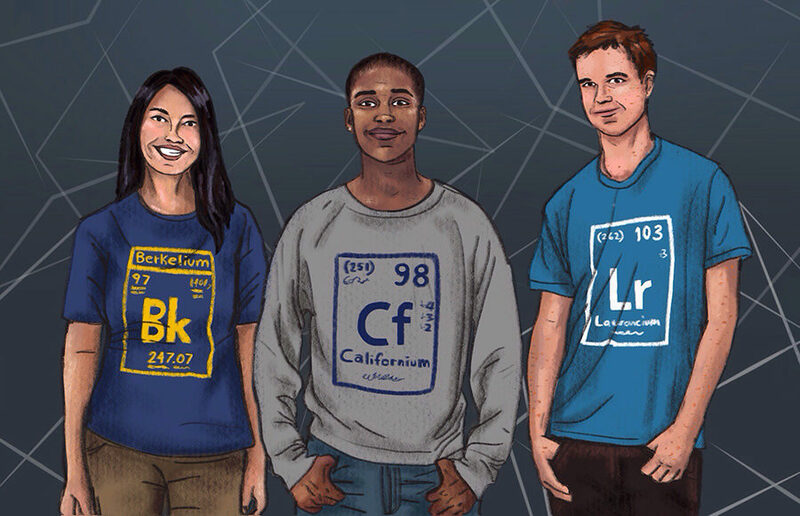 So wear your berkelium and californium T-shirts (and your lawrencium and seaborgium ones, too) with pride. They represent UC Berkeley’s legacy not just in physics but equally in nuclear engineering, which remains essential to the campus’s mission to serve California, the United States and the world. Peter Hosemann is a professor in the campus department of nuclear engineering. Alan Bolind is a research scientist in the campus department of nuclear engineering.